CITY OF AKRON: Today (Monday), Akron Mayor Dan Horrigan and Health Commissioner Donna Skoda joined together with community partners to mark the public release of Akron’s Youth Violence Prevention Strategic Plan. The plan—which was developed after more than two years of research, data collection and community conversations with neighborhood stakeholders—calls for a 20%+ reduction in youth violent crime in Akron by 2023. The Youth Violence Prevention Steering Committee is comprised of leaders from government, public health, recreation, education, law enforcement, corrections, and non-profit community organizations. The Youth Violence Prevention Strategic Plan targets older youth, ages 15 to 24. The plan is intended to remedy the weaknesses in Akron’s continuum of comprehensive services for all at-risk youth by plugging the service gaps for youth in the targeted age range. Each approach will require the commitment of various community partners. Summit County Public Health will be the lead agency on coordinating implementation of the plan among all the partners. A full copy of the Youth Violence Prevention Strategic Plan—including Steering Committee and Workgroup members, data graphs and maps, and a list of resources currently serving local youth—can be found at www.akronohio.gov/preventyouthviolence. Temporary Boil Water Advisory for Fairlawn Hts. (City of Akron) As a result of work being performed by a contractor of the City of Fairlawn, an Akron water line at the intersection of Waltham and Wyant Roads was inadvertently damaged. The City of Akron Water Division has issued a precautionary boil water advisory for certain customers located in Fairlawn Heights. The limits of the advisory are shown in red on the enclosed map and listed below by street name. As a precaution, and in accordance with EPA regulations, all customers within this area are advised to boil their water until further notice. Water used for drinking or cooking should be brought to a full boil for a minimum of 2 minutes and returned to the proper temperature before use. This advisory will be in effect until further notice, but for a minimum of 24 hours. Be advised that Akron water customers in the vicinity of this advisory may experience water discoloration because of this water main break. A release will be issued when the boil water advisory is lifted. Please contact the Akron Water Distribution Dispatch at 330-375-2420 for further updates. All Customers on Juno Place, Waltham Rd., Wyant Rd., Addyston Rd., Holgate Rd., Worthington Rd., Kimberly Rd., Brice Rd., Inverness Rd., Somerset Rd, Tinkham Rd., Quaker Ridge Dr., Halifax Rd., Amesbury Rd., Barnstable Rd., Yarmouth Rd., West Fairlawn Blvd., East Fairlawn Blvd., Stockbridge Rd., Sagamore Rd., Wembly Rd., Dow Dr., Lancaster Rd., Audubon Rd. and Audubon Spur. Ely Rd. from Hampshire Rd to S. Frank Blvd. The Ohio Department of Transportation announced Friday that the recently scheduled repair work on the East Avenue Bridge has been delayed due to weather as temperatures are expected to hit single digits, not factoring in windchill. Brent Kovacs with ODOT District 4 tells the WAKR Newsroom that all of the scheduled work needs to be started and completed at the same time, so even if there were a window to get a portion of the repairs underway, they couldn't. Beat the Chilly Weather... With Chili! The 13th Annual Firefighters’ Chili Challenge, sponsored by the City of Akron, will take place inside the Lock 3 dining area on Friday, January 18th from 11AM until 1PM (or earlier, if the chili runs out)! Each year, Akron firefighters issue the challenge to see who can create the best chili, served to Downtown employees and visitors. Some chili variations are traditional, while other teams set themselves apart with distinct flavors and ingredients. Tickets for six samples of chili and a beverage are $10. Individual chili samples are available for $1.50. Beverages are also available for $2. All proceeds benefit Akron Children’s Hospital Burn Institute. The 2019 competitors include the Akron Fire Department, The Akron Police Department, the City of Akron Human Resources Department, ARCADIS, Cleveland Clinic Akron General Hospital and the City of Akron Office of Integrated Development. Teams will be competing for Judge’s Choice and People’s Choice, and the Joe Smith Spirit Award. The Joe Smith Spirit Award was created in honor of Detective Joe Smith, an active supporter and participant in previous chili challenges, who passed away in 2014. (City of Akron) On Monday, Mayor Horrigan has released the findings of the Community Needs Survey which collected community sentiment and preferences related to the Akron Recreation Bureau. The survey was conducted between July 28 and September 19, 2018 and reached 1,500 households representing more than 3,100 people. The survey will form the basis of strategic changes in the Recreation Bureau that will include an enhanced focus on aquatics, community events and effective communication. The survey is part of a comprehensive strategic planning process for the Recreation Bureau, announced by Mayor Horrigan during his 2018 State of the City address. This is the first time the City of Akron has taken a comprehensive look at Recreation services since the 1969 report commissioned by then-Mayor John Ballard in response to civil unrest. The more aware residents were of programming and services, the more likely they were to view the Akron Recreation Bureau as highly valuable. The Bureau was generally perceived as affordable, fun, and safe. Aquatics (pools and splash pads) are important neighborhood anchors. Different demographic groups and neighborhoods experience the Recreation Bureau differently. More effective communication – including increased use of social media – could improve the use of facilities and programs and increase satisfaction among users. The Bureau will launch a rebranding campaign, including a new mission and vision statements, later this year. New or improved programming and offerings will begin this year based on the community feedback related to each of the individual community centers. (City of Akron) Effective Wednesday, January 2, 2019, continuing through Monday, January 6, the City of Akron Sanitation/Curb Service Division will permit residents to place extra trash, in the form of wrapping paper and boxes alongside their trash carts, on their normal collection day. "Each year we provide this extra service to our residents after the holidays, most of whom have additional items to discard or recycle,” Mayor Dan Horrigan said. "This particular pickup is intended for extra holiday items, like wrappings and boxes, which we realize won't all fit in one or maybe even two trash carts." Following the holidays, the City will also collect residents' holiday trees left alongside trash carts on their normal collection day. As always, customers who wish to put out a larger volume of other household trash are asked to contact the Mayor’s Action Center at 3-1-1, (330) 375-2311 or www.akronohio.gov/311 to pre-schedule one of the three special bulk pickups allotted to each household, each year. Please note, there will be no curb service on Tuesday, December 25 (in observance of Christmas Day) or Tuesday, January 1 (in observance of New Year’s Day). Curb service will resume Wednesday through Saturday, on a one-day delay. The City of Akron says they've finished their road repaving project that was funded by the passage of Issue 1, the quarter-percent income tax increase, voted in by Akron voters back in November of last year. More than 41 miles of city streets have been repaved over the course of the past year, the majority of which was done on residential streets, according to the city. (CIty of Akron) The City of Akron has completed the 2018 repaving schedule as projected and on budget. A dedicated stream of funding, which came from the quarter percent income tax increase that was passed by voters in November of 2017, was allotted specifically for roads. As projected, the increased funding allowed the City to repave an additional 37.5 miles of roadway, on top of the 17 miles previously designated in the City budget. Of the completed work, 41.5 were residential streets and 13 miles were arterial/collector streets. The 2018 repaving work was split approximately evenly among Akron’s 10 wards, and was planned based on both the 2015 State of the Streets study and an annual street survey that determines the Pavement Condition Index (PCI) of Akron’s roads. In addition to the streets that were scheduled for repaving in 2018, several streets were improved in conjunction with other projects, such as Aqueduct Street as part of the Green Improvements project, Main Street for the ODOT Main Broadway Interchange project and Cedar and Exchange Streets for the Cedar/Exchange Street safety enhancement project. The ¼% income tax increase took effect January 1, 2018, and raised approximately $13 million in 2018. These additional funds helped to replace lost revenue from the State of Ohio, and allowed the City to begin making long-awaited and much-needed improvements to the City’s public safety and roadway infrastructure. As promised, Mayor Horrigan will continue to divide these new funds roughly equally between police, fire/EMS, and streets each year. (City of Akron) As part of the Main Street Corridor project, Dominion Gas line repair and replacement work will begin on Main Street in front of Lock 3 on Nov. 26, resulting in some closures and impacts between State Street and Bowery Street. One lane of north and south bound traffic will be maintained, and on-street parking will remain on the east side of the street. The City of Akron and coordinating partners are working hard to continuously maintain proper pedestrian access to Main Street businesses and entertainment. Patrons are asked to use the sidewalk on the east side of the road and cross at the mid-street crossings that will be set up. Pedestrians can access Lock 3, Lock Next and the businesses directly across from Lock 3 via a mid-street crossing at University Avenue. Access to the Civic theatre will also be maintained with a mid-street crossing in front of the entrance by the Peanut Shoppe. In order to best support activity downtown during construction, the City of Akron and Downtown Akron Partnership will begin to work with the Main Street businesses to both promote current delivery service options and implement delivery services for more businesses, as well offer walking tours meant to help patrons navigate the downtown closures. Shortly after the completed of Dominion Gas work, which is anticipated to be completed the week of December 24, section 3A of the Main Street Corridor Project will begin in that same area. The Main Street Corridor work is a two-phase project made possible through two federal Transportation Investment Generating Economic Recovery (TIGER) grants. Work on Phase 1 began July 9 and is expected to be completed in 2020. Throughout construction, the City will continue to host various stakeholder engagement activities in collaboration with the Downtown Akron Partnership, to ensure sustained dialogue about the project and its impact on the downtown community. Phase 1 is a $31 million effort to reconstruct all infrastructure from building face to building face along the South Main corridor width, between Cedar and Mill Streets, including: new pavement with a lane dedicated to parking/buses/delivery vehicles, new sidewalks, a permanent bicycle track, upgraded underground utilities, upgraded traffic signal equipment, smart LED lighting, a roundabout at Main and Mill Streets, storm water management improvements, and a complete rebuild of the State Street bridge. Also included in the scope are all the amenities needed to make this an attractive corridor including landscaping and public benches. The City of Akron was awarded a second, $8 million TIGER grant in 2018 to help fund Phase 2 of the Main Street Corridor Project. Phase 2 will extend improvements to an additional segment of Main Street from Mill Street to Perkins Street/Route 59. It is the second phase of a 1.4-mile green corridor through the heart of the city. The stretch is designed to connect people to centers of education, employment, innovation, entrepreneurship, culture, entertainment and recreation. The City of Akron has delayed the 2018 leaf pick up schedule by one week as a result of the extended warm weather and leaves falling later this year. The printed leaf removal schedule that was included in October’s water bill shows the original dates and will now be delayed by one week. Residents may use any of their three annual free curb service bulk pick-ups for leaves if they choose to schedule for an earlier date. For early pick up, the leaves must be bagged. We remind residents not to rake leaves into the street until the day before scheduled leaf pickup. Each of the wards will take more than one day to complete. Leaves must be on the street by the dates listed – if they are not out, they may not get picked up. The City will make one round through each ward, and the schedule is subject to change in the event of adverse weather conditions. After one round of City-wide leaf removal has been completed, leaf crews will work to fulfill as many additional pick up requests as possible before winter. For more information, visit the City website or call 3-1-1 (375-2311). (City of Akron) The U.S. Department of Justice, Office of Justice Programs, awarded the City of Akron a 3-year Sexual Assault Kit Initiative (SAKI) grant. The purpose of the grant is to develop a multidisciplinary working group that will be trained in a victim centered, trauma informed approach to review, prioritize, investigate, and prosecute sexual assault cold cases. Currently, APD doesn’t have adequate staffing to support a comprehensive response to cold case sexual assault cases. Beginning in 2012, the Akron Police Department began assessing every sexual assault kit collected since 1993 in order to submit or re-submit the kits for DNA testing under the 2011 Ohio Attorney General’s Sexual Assault Kit (SAK) Testing Initiative. All SAKs in APD’s inventory were submitted and returned. The Ohio Bureau of Criminal Investigation (BCI) has tested and returned 1,822 tested sexual assault kits (SAKs) to the Akron Police Department (APD)—847 of which returned a CODIS eligible profile—from cases 1 year or older. 975 kits did not return a DNA profile, but additional evidence (clothing, linens, etc.) may exist that could be tested. There is a great need to provide follow up investigation for all kits and—where possible and desired by the victim—prosecution. Akron voters will decide in November whether or not the city's primary election will be held in September, as it has been, or move to May, as the Mayor's Office is proposing. City Council held a special meeting Tuesday, approving the ballot measure, after the Board of Elections verified more than 6,100 signatures that Mayor Dan Horrigan's Office collected. The Mayor's efforts exceeded the requirement per the Board of Election, as he actually collected nearly 9,200, and only needed a little more than 4,200 valid, Akron resident's signatures. Akron, Ohio, September 5, 2018 – A ballot measure to move the local primary election from September to May—to better comply with state law regarding overseas and military ballots, increase voter turnout and save taxpayer money—will come before Akron voters this November. More than 6,100 Akron voters signed petitions submitted to Council, requesting the opportunity to vote on the issue. The grassroots petition effort spearheaded by Mayor Horrigan, Council President Sommerville and Vice President Fusco well exceeded the number of signatures required to place the issue on the ballot. Council approved the petition-initiated measure at a special meeting held yesterday evening. The May primary proposal was first announced in early July as a joint effort by several Summit County communities that currently hold primaries in September. September primaries, which predate early voting laws, now conflict with state law intended to ensure overseas voters, including active duty military, can participate fully in local elections. This change would provide ample time for the Board of Elections to certify results before the general election. For Akron, a May primary would save taxpayers more than $80,000 each election and could increase voter turnout by about 46%. Cities in 85 out of 88 Ohio counties and the State of Ohio already hold primaries in May. Shall Section 4 of the Charter of the City of Akron be amended to move the primary election date for municipal elections to the first Tuesday after the first Monday in May consistent with the primary election date established by state law? (City of Akron) Today, Mayor Dan Horrigan joined the members of the new Akron Fulton Airport Advisory Board to announce the City of Akron’s recommitment to the future of the airport as an economic development driver for the city and region. The Akron Fulton Airport Advisory Board was formed earlier this year to make recommendations to City leadership and provide insight into how to best channel resources to catalyze business development. The Advisory Board has been busy developing a strategic plan for the airport’s future use and development to achieve the Mayor Horrigan’s vision. Included in this plan are efforts to enhance service to customers and rebrand and market the airport. The City’s Office of Integrated Development stands poised to assist and support the attraction of new airport customers and development in and around the airport. The City is making important capital investments in the airport as well, including flight obstruction clearing, which is nearly complete. These improvements will allow for flight operations at night and during low visibility conditions. The resurfacing of main runway 7-25 will take place in 2020, followed by the removal of the north-south runway 1-19. Both projects are funded 90% by the Federal Aviation Administration, 5% by the Ohio Department of Transportation, and 5% by local City funds. These improvements, along with the demolition of the Rubber Bowl, will open up new opportunities for development that can complement flight operations. Akron City Council was one vote shy of passing a measure that would have moved the City's primary election from September to May. But Akron Mayor Dan Horrigan says the fight isn't over. Mayor Horrigan's office has been a vocal proponent of moving the Primaries, and for a number of reasons, as the Mayor tells the 1590 WAKR Newsroom. Those reasons being that the city would save roughly $84,000 per year, that voter turnout would be higher, and that the city, by aligning the primary with the statewide primary, would be in compliance with a state law regarding the timing of when absentee ballots are sent to overseas voters and military voters. Opponents within City Council claim that the primary move is of a political nature and favors incumbents, adding that minority candidates are hurt by a shorter primary season as they're unable to raise enough money to give themselves a fighting chance in the eleciton. To his opponents, Mayor Horrigan says, "I'll do a serious debate with anybody across the City to be able to convince people to be able to do this, and if there's a real opposition to this, let the voter's decide... and we'll live with the results just like everybody else." The Mayor is committed to getting the necessary 4,200 signatures from Akron residents to get the measure on the November ballot, saying it should be up to the voters to decide. Former Akron Police Chief James Nice is suing the City of Akron, Mayor Dan Horrigan, and current Police Chief Ken Ball for defamation of character according to the suit that was filed in U.S. District Court in Akron Tuesday. In addition the Cuyahoga County Prosecutor's Office is looking to get Nice's guilty plea that was filed in February, tossed out. In the lawsuit, Nice said that he only pleaded guilty attempted unlawful use of property to avoid prosecution for more serious meritless offenses. The City of Akron released a statement, pointing out that Jim Nice voluntarily resigned his position last August after "serious allegations" of conduct unbecoming an officer. The statement went on to say that "at no point did the City misrepresent any information or mislead the public" regarding those allegations. James Nice voluntarily resigned from the City of Akron on August 27, 2017, following serious allegations that he engaged in conduct unbecoming of a member of the Akron Police Department. When asked to respond to the allegations against him, James Nice chose to resign rather than face disciplinary action. James Nice later pled guilty to a misdemeanor offense related to his criminal misuse of a police database and surrendered his Ohio Peace Officer Training Certification. Throughout this period, the various allegations against James Nice caused the City of Akron and the men and women of the Akron Police Department significant unwanted disruption and embarrassment. At no point did the City misrepresent any information or mislead the public in any way regarding the former Chief’s apparent misconduct. In 2018, the City of Akron and the Akron Police Department have moved on from that unfortunate chapter and are rightly focused on doing the critically important work of the Department – making Akron’s neighborhoods safer, protecting Akron homes and businesses, and improving the lives of Akron residents through engaged community policing. While it is unfortunate that any additional taxpayer resources will be spent responding to a frivolous lawsuit by the former Chief, the City and Akron Police Department will not be distracted from fulfilling the work the community expects and deserves - responding to the pressing needs and concerns of our citizens and pursuing meaningful solutions to those truly important issues facing our city. Sean Michael Blackburn. 33, of Akron has been charged with Aggravated Vehicular Homicide for allegedly killing a 21-year-old Cuyahoga Falls man in a drunk driving accident back on April 7th. According to the police report, Blackburn, who was driving while intoxicated, crossed North Main Street into oncoming traffic and hit Thomas Leslein's car head on. Leslein died, two others in his car were seriously injured. Blackburn denied being the driver, telling police that he was "too drunk to drive" and that another patron he was with at a local bar was driving his car. Blackburn reportedly even claimed at one point he didn't know who he was. Police say they found the keys to his car in his pants pocket. The police report shows that Blackburn blew a 0.119 in a BAC field test. The City of Akron has released details, including maps and the budget breakdown, for this year's multi-million-dollar road resurfacing project. According to the Akron Beacon Journal, Kenmore Construction secured the contract for the work, at nearly $6.4 Million; they'll begin work in mid-May. Watch your speed along Akron City streets in the coming months, as APD is starting to crack down on speeders. The request is coming from Akron City Council, who will be working with the Police Department's Traffic Commander to decide which areas to target. Akron Police Chief Ken Ball tells the Akron Beacon Journal that the department is adding three, four-hour patrols each weekday, to rotate between Akron's 10 wards. Typically, shifts will run late afternoon, which is a high-volume time around the city. Akron Mayor Dan Horrigan has released the full budget plan for the funds the city raised through the successful passage of Issue 4 on the November ballot. Below is the full release and budget from the Mayor's office. Today, Mayor Dan Horrigan released the City’s plan for spending “Issue 4” funds in 2018. The budget outlines a plan for more than $13 Million in increased investment in police and fire protection and roadway improvements in Akron. On November 7, 2017, Akron voters overwhelmingly supported Issue 4, a charter amendment that levied an additional .25% income tax to support police, fire, and roadway improvements in Akron. The tax took effect on January 1, 2018 and the City will receive additional revenue starting in February. You can see the full budget here. It was announced Monday from the mayor’s office than Dan Horrigan will be eliminating three positions in his cabinet. Those positions are in communications, health and education, and community relations. Horrigan, the mayor of Akron, joined the Ray Horner Morning Show to discuss why he made this decision. With the revenue falling short, Horrigan says he wanted accountability to start with his office. The layoffs, according to the mayor, are “purely for economics,” as this will free up close to $430,000. Speaking of economics, Horrigan also touched on the dollar allocation from Issue 4. He explains Issue 4 is an 11-month collection, and that will not begin until February. The City of Akron has partnered with Service Line Warranties of America (SLWA) to offer homeowners optional residential external water service line warranties. The coverage is voluntary and available at affordable monthly or annual prices. Founded in 2003, SLWA has partnered with over 400 leading cities and municipalities in the U.S. to provide repair service plans that offer peace of mind and convenience. Many factors contribute to the life expectancy of a service line including the age, type of piping material, soil conditions and installation quality – all factors which are covered through the SLWA protection program. This program is voluntary for residents and provided at no cost to the City of Akron and no public funds are used to promote or administer the program. SLWA has been recognized as the nation's largest and most trusted source of utility line plans endorsed by the National League of Cities (NLC). The company is committed to customer service, ethical marketing practices and maintaining an A+ accredited rating with the Better Business Bureau. For questions about this service, or to enroll, please contact SLWA at 866-922-9006 or visit www.slwofa.com. The cold isn't going anywhere, so the City of Akron has extended hours for four local community centers throughout the city that have been converted into "Warming Centers" for those stuck outside in the dangerous cold. Akron, Ohio, January 2, 2018 – Effective today (Tuesday, January 2) and continuing through Saturday, January 6, the City of Akron will be extending hours in four community centers to provide warming centers for residents who are in need. “As we continue to face temperatures in the teens and single digits, we will be extending the operating hours of our community centers throughout this week in order to provide our residents with a warm place to drop in and escape the cold,” Mayor Dan Horrigan said. The City will continue to monitor for continuous frigid temperatures and will extend community center hours as necessary. Unless otherwise specified, the centers will return to their normal business hours starting Sunday, January 7, 2018. Akron is in store for more bitter cold temps as we make are way toward the New Year, with overnight lows in the single, even negative digits Saturday and Sunday. In response, the City of Akron has extended cold shelter hours at various community centers throughout the city.. Mayor Horrigan said, in a press release, "The City of Akron would like to do our part in making sure we provide a warm place to drop in and escape the cold." Meanwhile, Haven of Rest Ministries is under a "Code Zero", reminding Akron area residents who may be looking for a break from the cold, that their doors are open 24 hours a day, 7 days a week. Haven is located at 175 E. Market Street in Downtown Akron. Effective Saturday, December 30, 2017 and continuing through Monday, January 1, the City of Akron will be extending hours in three community centers to double as warming centers for those residents who are in need. The City will continue to monitor for continuous frigid temperatures. Unless otherwise specified, the centers will return to their normal business hours starting January 2, 2018. Akron Mayor Dan Horrigan has officially named Ken Ball the 16th Police Chief for the City of Akron's police department Wednesday. Ball, who has been with Akron Police for 26 years, has been serving as interim chief since the abrupt resignation of former Police Chief James Nice back in August. Nice was asked to resign by Mayor Horrigan after allegations of professional misconduct and was said to be criminally involved with his nephew's car dealership in the city. Nice's attorney has denied any criminal wrongdoing. During the press conference, Mayor Horrigan said that when deciding to promote within, he knew that he needed someone who understood that while the Akron Police Department is an outstanding law enforcement agency, wouldn't accept the status quo and would always be looking to move the department in a forward direction. Of the appointment, Chief Ball said that he will approach the office with "quiet disconent," meaning he will not be the chief that is banging on doors, demanding change. Instead, Chief Ball says he will be someone who, "internally, not satisfied with where they're at," and always seeking improvement and to get better. The initial term for Chief Ken Ball's office is four years. Akron Mayor Dan Horrigan says it's a criminal investigation that led to his surprise call Sunday to Chief of Police James Nice to resign -- and not the death of a teenager Friday in the backseat of a police cruiser of a self-inflicted gunshot wound. Nice delivered a terse 30 word resignation letter around 4:00 yesterday afternoon. Mayor Horrigan told reporters this afternoon he had been informed by police higher-ups that the Chief was part of an investigation involving his nephew, Joseph Nice of Uniontown, who is under indictment relating to his auto sales business. The case involved possible criminal misconduct by Nice, city officials said, including making derogatory comments and inappropriate conduct with city employees. The City says it will turn the information over to the Summit County Prosecutor, but wouldn't provide more information or a timeline. Joseph Nice of Uniontown was indicted for grand theft and forgery in March of this year. His criminal case is being heard by Judge Jason Wells in Summit County Common Pleas Court. The nephew Nice is also listed in numerous civil lawsuits in Summit County, including lawsuits alleging fraud and breach of contract for the sale of automobiles through Metro ACC Car Sales on Waterloo Road. Akron, Ohio, August 28, 2017 – Mayor Horrigan formally asked for, and accepted, the resignation of City of Akron Police Chief James Nice effective Sunday, August 27th, 2017. Evidence of conduct unbecoming of an officer, inappropriate contact with a city employee and potential criminal misconduct led him to make this immediate decision. The City will be referring any and all information regarding potential criminal conduct to the County Prosecutor. Mayor Horrigan appointed Major Kenneth Ball as acting Chief of the Akron Police Department, effective August 27th. Ball, an Akron resident, has more than 26 years of service to the Akron Police Department. He joined the Akron Police Department in 1991, was promoted to sergeant in 1997; lieutenant in 2000; captain in 2006; and major in March of 2015. He graduated from the Police Executive Leadership College in 2001, and from the FBI National Academy in Quantico, Virginia in 2013. Mayor Horrigan will work closely with Deputy Mayor of Public Safety Charles Brown and Director of Human Resources Don Rice to select a permanent police chief, in accordance with the Charter of the City of Akron. Akron's City Prosecutor's office is moving out from the dark ages into the digital era. The partnership with the Summit County Prosecutor's Office means city prosecutors will be able to use electronic case filing for the first time -- eveything up to this point was still pen and paper. Municipal Courts across the county have long used electronic filing. (City of Akron) The Akron City Prosecutor's Office is preparing to improve the efficiency and consistency of its case management system by partnering with the County of Summit and surrounding communities to implement case management software, enabling the use of electronic case files for the first time. Currently, the City of Akron Prosecutor's Office utilizes an outdated case management system that relies entirely on physical paper files. This inefficient system creates substantial storage issues and results in unnecessary work in copying, moving, and organizing tens of thousands of active files. "The goal of this agreement is to bring our system into the digital age, in the most costeffective way possible," Mayor Horrigan said. "This new software will improve our responsiveness to the attorneys, judges, and others who need access to these criminal case files to ensure the effective administration of justice." "By cooperating together with the County and other communities, we are able to defer the costs of this case management system and acquire this valuable software at a fraction of the cost," Mayor Horrigan continued. "I would like to thank the leadership of Barberton, Cuyahoga Falls, Stow, Tallmadge and Summit County for combining resources to purchase a universal case management system that will improve prosecutorial efficiencies system-wide." Monday, Akron City Council authorized the Intergovernmental Agreement with Summit County and neighboring jurisdictions for the shared purchase, implementation and use of MATRIX case management software. The secure system will allow defense attorneys and other authorized personnel access to court records in compliance with the law. The new system will enhance public confidence in the integrity of case files by eliminating manual processes and creating a record of when evidence is provided and reviewed in the course of a criminal prosecution. "This software will allow for better management of criminal caseloads, it will reduce staff time spent on time-consuming administrative tasks like copying, and allow us to automate and integrate internal process as cases move through the system," Chief Akron Prosecutor Gertrude Wilms said. Recognizing the benefits and need for a comprehensive case management software system, Summit County engaged in a review of various case management systems and determined that the MATRIX Case Management system was the best combination of functionality and value. "We are very pleased to soon begin using the MATRIX case management system which replaces our current outdated and obsolete system that was first installed 20 years ago," Summit County Prosecutor Sherri Bevan Walsh said. "MATRIX will make tracking information about cases much easier for our prosecutors, staff, and victims, and make the office more efficient. I would like to thank the City and County for their efforts in making this happen." During the Akron City Council committee discussion, it was reported that Cuyahoga County experienced a cost savings of over $6 million within the first 9 months of switching to the MATRIX case management system, while also reducing the time it took cases to move through the system. You can't fight City Hall -- but Mayor Horrigan would at least like to have one you can talk with. The Mayor unveiling what he's calling the Akron Citizens Institute to give up to 25 citizens regular opportunities to meet with department heads to learn more about how city government works -- and give department heads more direct feedback, too. Applications are now being taken online at the City's website. (City of Akron) The City of Akron is committed to directly empowering residents and educating the public about how their city government works for them. That's why Akron Mayor Dan Horrigan is proud to announce that applications are now being accepted for the inaugural class of the City of Akron Citizens Institute. The Citizens Institute will provide Akron residents with an opportunity to gain an inside view of the operations of City government while engaging directly with City of Akron leaders. "If residents don't know or understand what is going on in the halls of their government, it can leave them feeling disconnected and disheartened," Mayor Horrigan said of the inspiration for this program. "It's our responsibility as government officials to engage residents by inviting them to the table, educating them about our rules and processes, and empowering them to give feedback." Mayor Horrigan asked his staff to design a diverse City-government curriculum and turn City Hall into a "community classroom" where residents can learn and ask questions of City leaders, department directors, and front-line staff. The City of Akron Citizens Institute will be a free, 10-week experience in which a group of approximately 25 Akron residents will meet once a week to engage with City departments and leaders and learn more about city programs and services. Residents will engage in discussions about the City's charter form of government, its responsibilities and duties, and its accountability to the public. Applicants must be 18 years of age, or older, and must be current residents of Akron. The Institute will run from late August through early November, 2017. The City of Akron is saving $17 million dollars on the cost of its sewer improvement project, through a reduced interest rate on a loan from the Ohio EPA. Akron Mayor Dan Horrigan says the city is committed to meeting environmental obligations and improving water quality, while also finding ways to reduce the cost of sewer projects for Akron rate payers. Meanwhile, work has begun on Cuyahoga Street, for the Carpenter Sewer Separation project. The $2.3 million dollar project is part of the city's massive, federally-mandated effort to separate sanitary sewers from storm sewers. Akron Mayor Dan Horrigan, during a speech at Akron's Fire Station #2 Thursday morning, announced that he is proposing a quarter-percent income tax increase to be put on the November ballot. Mayor Horrigan cited several reasons for the "necessary increase," including deteriorating roads and Akron Police Department and Fire Department needs. "The City of Akron continues to lose about $15 Million every year from the elimination of fair tax sharing in the state of Ohio," the Mayor said. Since the Recession of 2008, Horrigan added, the city has lost a total of $80 Million in unrealized income tax revenue. If approved by City Council, the issue would be placed on the November ballot for Akron residents to vote on. The proposed increase would raise the current income tax rate of 2.25% to 2.5%. The City of Akron hasn't had a general income tax increase (see next paragraph) since 1981 for "essential city services", Horrigan said in a prepared release. He says the city desperately needs this proposed increase for new, updated police cruisers and fire trucks; to support the APD body camera database; and to improve roughly 45 miles worth of Akron roadways, just to name a few things. Akron voters approved a boost in the municipal income tax by .25 percent in 2003 dedicated to fund an $800 million dollar, 15 year plan to rebuild local schools as Community Learning Centers by the Akron Public School district. That project has been underway but has been scaled back with the loss of student enrollment across the district. State funds are used as well as local funding generated by the Akron income tax percentage taken for the school rebuilding project. Mayor Horrigan touted his adminstration's efforts to continually do "more with less," but says the increase is necessary to maintain safety efforts and keep up with regular road maintenance and repaving efforts. Akron Police Chief James Nice and Fire Chief Clarence Tucker were on hand for the Mayor's announcement Thursday, and they both expressed their full support for the tax increase. The Mayor will officially present his proposal to Akron City Council this coming Monday, June 26th. Akron, Ohio, June 22, 2017– Today, Mayor Horrigan announced his proposal for a ¼% earned income tax increase to fund capital and operating needs for police, fire/EMS, public service and roads in the City of Akron. The income tax proposal, if passed by City Council, would be placed on the November 7, 2017 ballot for approval by Akron voters. On average, the funds would be spent between police (1/3), fire/EMS (1/3), and streets (1/3). “It is essential that we provide our police and fire/EMS personnel with the equipment and facilities they need to protect our neighborhoods and keep us safe. And, we simply cannot allow our roads to deteriorate further if we expect our neighborhoods and business districts to thrive,” Mayor Horrigan said. The City of Akron has lost $15 million per year in fair tax-sharing from the State of Ohio and lost an estimated $80 million in unrealized income tax revenue since 2008, as a result of the recession. Without replacement funding, the City would be forced to make difficult budgeting decisions that would impact City services across the board. Police Chief James Nice and Fire Chief Clarence Tucker joined Mayor Horrigan to express their full support for the proposal and detail the dire needs of their departments—including the need to launch a body-worn camera data storage program, replace two aging fire stations, at least one pumper truck, and 63 police cruisers in poor condition. The additional ¼% income tax only applies to income earned at a job and will not affect retirement/pension income, social security, or other government benefits. Two-thirds of the funding raised through income tax collection is paid by commuters who work in Akron but live in other communities. If successful, this proposal would raise Akron’s income tax to 2.5% – consistent with cities like Cleveland, Columbus and Dayton. The cost of the additional ¼% tax is $1.68/week, for a resident earning Akron’s median income of $35,000. The Mayor concluded by renewing his commitment to continue to control spending. “Even with an income tax increase, we must continue to explore ways to spend smarter, and prioritize funds where they’re needed most.” The legislation authorizing the ¼% income tax increase will be introduced to City Council on Monday, June 26th . The State of Ohio is also kicking in $225,000 to be used for employee training. Hiring is expected to be completed by the end of the year. (Huntington Bank) Huntington Bank today renewed its commitment to Akron announcing plans for workforce employment of 1,200 by the end of 2017 and a path to sustained and new local employment through 2022. Akron’s Mayor, Daniel Horrigan joined Huntington’s CEO, Steve Steinour, and Akron Regional President, Nick Browning, today at Huntington’s downtown office complex at Cascade Plaza for the company’s announcement of its local employment plans. As part of the merger with FirstMerit in 2016, Huntington committed to prioritize sustained levels of Akron employment. In doing so, Huntington has retained a current Akron workforce of more than 1,100 employees, will increase overall employment within the city to 1,200 by the end of the year, and is incentivized to continue employment expansion in Akron. As part of the agreement, Huntington and the city have undertaken and plan many improvements to Cascade Plaza and its buildings complex. The city will replace and upgrade Cascade Plaza parking deck lighting and improve directional parking signage. The city also will restore Cascade Plaza’s back stairs overlooking Quaker Street as part of overall restoration plans for Cascade Plaza Hotel, which also may include construction of an access road from Bowery Street to the hotel. Huntington has invested more than $5 million in completed or ongoing improvements at its operations center at 295 FirstMerit Circle, 3 Cascade Plaza and Huntington Tower. Improvements include temporary call center expansion at 3 Cascade Plaza and long-term call center expansion at 295 FirstMerit Circle. Huntington also installed building signage atop Huntington Tower and on 3 Cascade Plaza in May. ”Partnering with local government, supporting a robust and talented local workforce and maintaining vibrant buildings where we our colleagues and customers live and work are among the many ways Huntington invests in our local Akron community,” said Browning. The City of Akron is looking to hire 15 new police officers and is accepting applications from now through May 26. Candidates must also be able to pass a written exam, a physical fitness test, background investigation, and be able to pass a polygraph. Find more information at www.akronohio.gov/personnel. The City of Akron is teaming up with the Salvation Army for another extension of their Community Table. Summit Lake will play host to the latest effort to feed more Akron-area individuals and families that need help. “This program demonstrates what is possible when we work together,” Mayor Horrigan said in a press release. “The City is investing significant energy and resources into lifting up the Summit Lake neighborhood, and we are happy to open our doors to host a hot lunch every day of the week at our Summit Lake Community Center. We thank the Salvation Army for their contribution to improving the lives of our residents and look forward to expanding this partnership to other community locations." The Summit Lake meals will be offered Monday through Friday from 11:30 a.m. to 12:30 p.m. In addition, the Salvation Army of the Akron area continues to offer daily meals at their Barberton and downtown locations. Anyone looking for more information on the meals or volunteer opportunities can check SalvationArmyAkron.org for details. Akron has a new fire chief, and Chief Clarence Tucker will be the second African-American to hold the post inthe Department's history. Mayor Dan Horrigan made the announcement today following several months of interviews; he fills the void left open when Chief Edward Hiltbrand retired in September. Retired Akron Fire Department Chief Larry Bunner served as Interim Chief during the selection progcess. Tucker becomes the AFD's 19th chief and has 28 years of service with the department. (City of Akron) Today Mayor Dan Horrigan announced his selection of Clarence I. Tucker to serve as Akron's next Fire Chief. This announcement comes after a months-long competitive selection process and several rounds of interviews. Tucker currently serves as a District Fire Chief, where he manages the City's Fire Prevention Bureau, which oversees fire inspection, public education, and arson units. Mayor Horrigan administered the oath of office to Tucker this morning at Akron Fire Station No. 7 on Tallmadge Avenue—the firehouse where Tucker was first stationed when he joined the Department nearly three decades ago. Tucker will be the City's 19th Fire Chief and the second African American to hold this top post in the 180 year history of the Department. Charles R. Gladman served as the City's first African American Fire Chief from 1997 to 2007. Tucker's promotion was prompted by the retirement of Chief Edward Hiltbrand in September of this year. Retired Akron Fire Chief Larry Bunner temporarily returned to the City to serve as Interim Chief while the Mayor selected a permanent successor. "I was fortunate to be presented with several highly qualified and exemplary public servants as candidates for this position," Mayor Horrigan said of his selection. "In Clarence, I found an immensely prepared and well-respected leader with an enormous heart for this community." "My vision for the future of the Akron Fire Department is to forge new, innovative partnerships, develop creative solutions to deep-rooted challenges like the opiate epidemic, and to continue our honored tradition of running a prepared, professional, and compassionate Fire Department. I have full confidence that Clarence will bring strong, steady leadership and a commitment to excellent customer service and patient care to this position." front lines and behind the scenes, every day, to keep us safe. I look forward to working together to continuously improve our performance and our service to the citizens of Akron." Akron's focusing on a new plan to freshen up downtown -- and much centers on Lock 3 and 4 as well as Main and Exchange Streets. Planners hope to have the new blueprints for their redevelopment program fleshed out more over the next year. (City of Akron) Today, Mayor Horrigan joined with DAP and Downtown stakeholders to announce the completion of Phase I of the Downtown Vision and Redevelopment Plan. 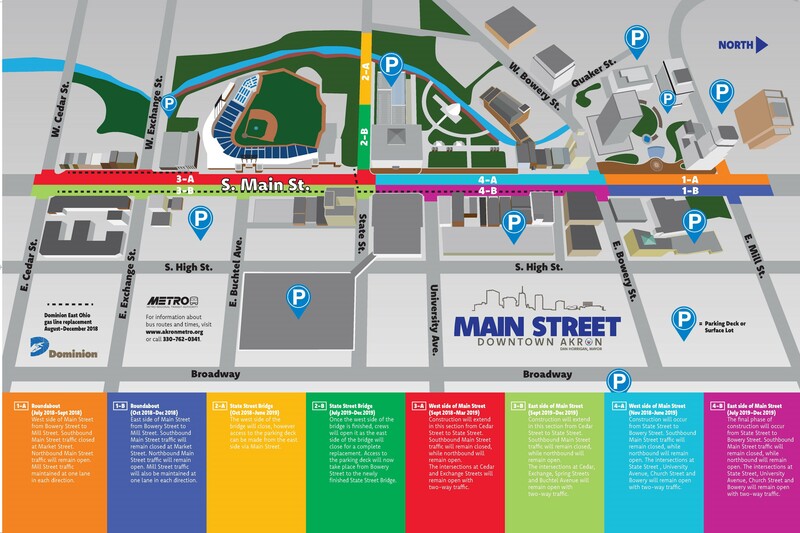 One of Mayor Horrigan's first long-term projects upon taking office this year was to partner with Downtown Akron Partnership (DAP) to embark on the development of a plan for Downtown. Last year, both the Blue Ribbon Task Force and DAP's strategic planning process identified the development of a Downtown Plan as a primary recommendation. A multidisciplinary group of 37 representatives from small and corporate business, development, city and county government, health systems, non-profits, finance, education, housing, tourism, real estate and philanthropy was assembled to populate the steering committee that led the effort. DAP contracted with nationally-recognized consultants MKSK of Columbus to lead the planning process, which was funded by the John S. and James L. Knight Foundation and GAR Foundation. "To compete regionally and nationally, Akron must have a thriving and prosperous urban core. We have remarkable potential for growth in Akron, but we need a long-term vision for our Downtown and a deliberate, realistic plan to create conditions that will spur catalytic private sector investment," Mayor Horrigan said. He adds, "Today we celebrate the completion of the first phase of the plan – a comprehensive review of the current conditions and the recognition of broad-based planning principles and key opportunity sites – and we look forward to the next phase, which will engage the community in setting priorities for fostering a revitalized Downtown that belongs to, serves, and connects all of Akron." Phase I of the Downtown Vision and Redevelopment Plan involved key stakeholder interviews and evaluating existing conditions as well as plans and processes that have been undertaken that intersect with the Downtown neighborhood. Phase II of the plan, which will involve further market studies, policy and implementation strategies and a broad community engagement effort to involve all Akron citizens, is already being discussed, with hopes to begin this process early in 2017. Through the Phase I process, ten planning principles were identified to be prioritized and integrated into new public or private developments. Some of the key principles include: focusing development on Main Street, prioritizing residential development, addressing business vacancy, creating a coordinated incentive package for development, expanding on successful nodes of activity, focusing on accessible, livable street design and prioritizing connecting downtown with Akron neighborhoods and institutions. Five key opportunity sites for development were identified as well as recommendations for each to activate growth. Of the five sites identified, The Lock 3 & 4 area and Main & Exchange were prioritized as the most critical and catalytic areas to focus development. neighborhood as a place to attract businesses, talent, visitors and residents and as a resource to benefit all of the residents of Akron. We are honored to have the trust of city leadership, downtown stakeholders and our philanthropic partners as we continue this partnership into its next phase and look forward to building our future together." Rolling Acres Mall is coming down. The Beacon Journal reports that demolition of the interior part of the long-closed mall has gotten underway, with the area between the former Sears and Dillard's stores the first target of the demolition crews. The city of Akron took over the mall property after a long foreclosure process ended earlier this year. Most of Rolling Acres' former department stores are not coming down - they're owned by private businesses now. But the former JC Penney store was donated to the city of Akron, and will be torn down separately. As expected, the City of Akron is looking to rein-in it's so-called "legacy costs" -- otherwise known as health care for retirees. It doesn't impact the state-funded main health care but it does impact supplemental health care now provided at no cost for retirees and their benefits. Under proposed changes City Council approved the changes: supplemental costs would go from free to $30 monthly for single, $60 monthly for families. The changes also hit those who have spouses already eligible for health coverage from their own employee with a surcharge if the other coverage is declined. (City of Akron) Akron Mayor Dan Horrigan and City Council President Marilyn Keith introduced four pieces of legislation in early September aimed at controlling legacy costs related to the City's supplemental retiree health care benefit. While City of Akron retirees' primary health care is provided through OPERS, OP&F and/or Medicare, the City of Akron has for many years provided additional, supplemental health care benefits, at no cost to the retirees or their dependents. However, as health care costs continue to escalate, the City was and is unable continue to provide this supplemental benefit at no cost. The City has investigated this matter and has determined that no other major city in Ohio provides this type of retiree benefit. The Mayor's Blue Ribbon Panel identified legacy costs, the majority of which relate to this benefit, to be at $9 million in 2014. This burden on taxpayers was expected to steeply increase in the next several years if changes were not implemented. Panel members recommended that the City reform this supplemental retiree benefit to protect itself and City employees from significant long-term financial risk. - Providing for a spousal surcharge where an eligible retiree whose spouse qualifies for health insurance benefits from his/her own employer and chooses to decline that plan, the City of Akron retiree is required to pay a spousal surcharge to elect to include the spouse on the City's supplemental health care benefits. After this initial legislation was introduced, Mayor Horrigan listened to feedback from the City's union leadership and responded by introducing alternative legislation, based on a union concept, that would have provided retirees with a stipend in lieu of any supplemental retiree health care benefit. The stipend option, which was withdrawn, would have provided similar financial savings to the City, but would have required retirees to seek out and acquire their own supplemental coverage. On October 17, City Council passed the first phase of the plan—offering this supplemental benefit to only persons hired on or before December 31, 2016. Tonight, City Council passed the remaining three ordinances to implement Mayor Horrigan and President Keith's original proposal to reign in legacy costs. "This was the most responsible course of action the City could take," Council President Keith said Monday. "Retirees will not be losing any benefits with these changes. Instead, these reasonable cost-saving measures will reduce costs to taxpayers and put retirees on fair footing with current employees. It made perfect sense to me." "It is one of our greatest responsibilities as City leaders to ensure that our City will be on solid financial footing, now and into the future," Mayor Horrigan said. "I deeply value the service of our current and retired employees and weigh that against the needs and costs placed on all City residents. Based on the findings of the Blue Ribbon Panel and the data provided by our consultants, I knew that doing nothing was not an option. I'm pleased that the members of City Council appreciated the reasonableness and necessity of these changes, and investigated and implemented them with due diligence. As we move forward, I will continue to find responsible, resourceful, and efficient ways to update our policies and practices in order to safeguard taxpayer dollars while ensuring the ongoing financial health and welfare of our City for this and future generations." City retirees should look for detailed communication from the City's Human Resources Department in the coming weeks with additional information on the how these changes will be implemented, and should contact the Employee Benefits Office of the Human Resources Department at (330) 375-2700 with any questions. The city of Akron is trying to jumpstart Lock 4 development, by suing property owners of two vacant Main Street buildings. The city filed suit against Main Street Partners and BTE Enterprises hoping to get the buildings back. The suit was filed late last month, and first reported by the Beacon Journal on Friday. "Unfortunately, this particular development has languished for some time," Hardy tells WAKR.net, "and as such, that has a ripple effect throughout downtown." Hardy says it's not just development that concerns the city. He says the buildings are historic landmarks as well. A state probe into alleged bid-rigging involving sales of a popular water treatment chemical is getting Akron's attention. The Ohio Attorney General's office says they're putting out the word to Ohio communities that used aluminum sulfate or "alum" in water treatment between 1997 and 2010. City water supply manager Jeff Bronowski says that definitely includes Akron. "In Akron, we purchase about 1.5 million gallons of the aluminum sulfate every year, and it generally costs us about a million dollars a year for that purchase," Bronowski tells WAKR.net, "which is one-third of our chemical budget. Bronowski says Akron would definitely cooperate with the probe. "We would fully cooperate with any investigation that would be there, we'd be involved with," Bronkowski says, "it's something we'd be definitely be interested in, and would provide any information that's needed in regards to this." Attorney General Mike DeWine cites three indictments of chemical manufacturing executives in a New Jersey court, charging illegal bid agreements between the companies to sell alum to purchasers - and shutting out fair competition. (Ohio Attorney General's office, news release) Ohio Attorney General Mike DeWine today announced that his office is investigating an alleged bid-rigging scheme involving sales of aluminum sulfate, or "alum," a chemical used to treat drinking water and waste water. Municipalities are urged to contact the Ohio Attorney General's Office if they purchased alum or ferric acid between 1997 and 2010 for their wastewater or drinking water treatment. "Many of Ohio's local communities use alum to treat drinking water and waste water," said Ohio Attorney General Mike DeWine. "We need information from local governments that have purchased alum to determine if they got a fair price or if the market was manipulated." Aluminum sulfate, otherwise known as "alum," is a chemical used to treat both waste water and drinking water. It's a coagulant (binding agent) that also is used by pulp and paper manufacturing companies. Three executives of chemical manufacturing companies have been indicted in federal court in New Jersey for their alleged roles in a scheme to reduce competition in sales of alum. The alleged scheme involved competitors agreeing among themselves who would win a bid or who would submit the lowest bid (and thus be most likely to win) to sell alum to the purchaser. Generally, bid-rigging schemes can cause taxpayers and government entities to pay artificially higher prices, because they don't get the benefit of fair competition among vendors. The Ohio Attorney General is authorized by law to represent municipalities and public entities in antitrust matters such as this one. A threat of possible legal action brought Akron City Council to a special meeting on Monday, over the constitutionality of the city's pandhandling laws. "It's gonna take a little bit of time obviously to review that," Fusco tells WAKR.net, "and to go out and seek what's best in terms of the city of Akron moving forward." Attorney Joseph Mead in Akron wrote the letter for the ACLU of Ohio, which says the city's had time to review it already. "We sent them a letter outlining all of the legal cases that I could find for years and years back in January," Mead tells WAKR.net, "and so, they've had a while to look at this, and I think they need to move quickly or we're going to ask a court to decide." Mead says a number of courts have struck down similar pandhandling laws elsewhere on first amendment grounds. With the opening of county offices in the Firestone Triangle building, the city of Akron is looking at the future of the main Firestone building. Akron deputy mayor for intergovernmental affairs Marco Sommerville says that there's one goal in mind for reuse of the Firestone building: jobs. "Of course, our first priority there, if we could get some type of manufacturing there, some type of office use, those are probably our first choices" Sommerville tells WAKR's Jasen Sokol, "but we'll entertain anything." Sommerville says given the condition of the Firestone building, it will probably be torn down for a new use at the site. "It is probably an older building, it probably is not energy efficient," Sommerville says, "and it probably would serve a better purpose if it was torn down and the land was redeveloped. But he says the city has a history of reusing existing property, like with Canal Place and the East End development at the former Goodyear headquarters, so that's not being ruled out either. The county offices at the nearby Firestone Triangle building are there for the long term. Outgoing Akron city planning director Marco Sommerville isn't leaving City Hall next year. He'll fill a new role as Deputy Mayor for Intergovermental Affairs, and serve as a senior advisor to new mayor Dan Horrigan. He says Horrigan "likes to listen more than he likes to talk". One issue that'll be on the city's plate is the long-vacated Rolling Acres Mall, no matter if it's finally sold, or goes back to the city. Whatever happens, Sommerville says the main priority for the former mall is to bring in new jobs. "We in the city are landlocked as far as land, there's not a lot of land left in the city of Akron," Sommerville tells WAKR's Jasen Sokol. "And if we could have that land to develop it for jobs, that would be priority number one." Sommerville says he'd like to see light industrial space or office space at the former mall site. But he says the city will have to work with the owners of space once taken by the mall's former department stores. Those buildings won't be directly involved in any sale or sheriff's sale of the main part of mall itself. Jason Segedy is getting ready to make the move from the Akron Metropolitan Area Transportation Study (AMATS) to the cabinet of incoming Akron mayor Dan Horrigan. Akron's new planning director has put forth a lot of ideas before being hired for Horrigan's cabinet. Segedy says that those ideas helped him to get hired, but he's practical as well. "They want someone in the cabinet that can kind of 'dream big', and I like to think that I'm a doer as well," Segedy tells WAKR's Jasen Sokol. "So, I try to do the pragmatic part of it too." Segedy says he wants to bring people who come back to the area after leaving, back to Akron itself. "We do get a lot of people who 'bounce back' to the area, that grow up here, move somewhere for a while and come back," Segedy says. "And I'd like to see the city do more to try to get them to maybe choose Akron over another community the region." Segedy says he wants to help regrow Akron's shrinking population, and says he wants to end the "rust belt" population loss narrative. The City of Akron says it has federal EPA approval for three proposed "green" projects in the city's sewer projects. Mayor Jeff Fusco says the agency has given written approval to the alternative projects that would separate stormwater from sanitary sewers in the Merriman Road, Middlebury and North Hill areas. The city and the EPA are still discussing the overall Integrated Plan, which Akron says could save it over 300-million dollars. Akron is also hoping to extend the project's completion date from 2027 to 2040. (City of Akron, news release) Akron Mayor Jeff Fusco today announced that the City of Akron has received written, approval from the U.S. Environmental Protection Agency for three projects in its proposed Integrated Plan that will help the city use more "green" alternatives--the alternatives proposed by the city to separate storm water from sanitary sewers in areas of Merriman Road in west Akron, the Middlebury area of east Akron, and the North Hill areas won EPA approval. Referred to as the "Merriman Separation – Green Project," the "Middlebury Separation – Green Project," and the "North Hill Separation – Green Project," the separations will control combined sewer overflows in these three neighborhoods. "I want to express my appreciation to the EPA and to the dedicated city employees and our consultants who have been working on this request for more than a year," said Mayor Fusco. "Active negotiations for these three modification requests have been underway for months between the City and the EPA. This is a major step forward in our efforts." Discussions on the Integrated Plan continue. The official Integrated Plan proposal was submitted to the EPA in August, 2015 and sought approval to decrease the number of storage basins from ten to five, plus increase the amount of separations from five to 13, while adding green infrastructure. One impact would be to reduce the number from two storage tunnels to a single tunnel, the Ohio Canal Interceptor Tunnel, for which ground was broken in early November. "Potentially, the Integrated Plan could save the City as much as $300 million dollars," said the Mayor. "This has the potential to reduce future rate increases." Currently, the City is also seeking approval for a proposal to stretch the timeline for completion of the project from completion in 2027 to completion in 2040. "The goal we worked toward was to develop a plan that identified projects that met our regulatory requirements while developing alternative projects that provided „equal or better environmental protection at a more affordable cost,." said John Moore, Director of Public Service. "By using 'green' sustainable solutions, along with new technologies, we were able to meet our goal." Akron's integrated plan proposal specifically suggests adding green elements, such as constructed wetlands, bump outs, bump ins, green streets and other environmentally-friendly initiatives to help achieve water quality standards. The Merriman Separation - Green Project (CSO Rack 36) will be the first area to receive the new infrastructure that will include curb and sidewalk bump-ins (bio-retention areas) and a constructed stormwater wetland. This will be followed by construction of the Middlebury Separation – Green Project (CSO Rack 5&7) with a constructed stormwater wetland. The City will then begin work on North Hill Separation – Green Project (CSO Rack 22), where another constructed stormwater wetland will be built. The City is continuing to discuss the Integrated Plan along with individual projects as needed in order to remain in compliance with the Consent Decree. The City of Akron has a new Deputy Director of Public Service. Chris Ludle, who has been the city's Highway Maintenance Superintendent, takes over next week for Phil Montgomery. Montgomery was appointed the city of Akron's Chief Information Officer after Rick Schmahl took a state job. Ludle has been in the city's Department of Public Service for 10 years, and spent 12 years at Rubbermaid. (City of Akron, news release) Mayor Jeff Fusco announced Wednesday the appointment of Chris D. Ludle as the City's new Deputy Director of Public Service, a position recently vacated by Phil Montgomery, who accepted an appointment as the City's Chief Information Officer. Ludle, who currently serves as the City's Highway Maintenance Superintendent, brings a decade of experience with the Department of Public Service to the position. Additionally, Ludle's twelve years of experience in the private sector at Rubbermaid will bring a valuable and needed perspective to the service operations that are most important to Akron residents. "Chris takes a comprehensive, hands-on approach to his work that I greatly admire,"
Mayor Jeff Fusco remarked. "As someone who held the position of Deputy Director of Public Service for 10 years, I know exactly what it takes to do the job. What I see in Chris is the right combination of experience and insight necessary to hit the ground running and shoulder the significant responsibilities of the position." "Chris's first-hand experience supervising aspects of the CSO project, as well as his substantial management and organizational experience will be an asset to the Director of Public Service's Office and the City," Mayor Fusco added. Ludle is a lifelong Akron resident, a volunteer Athletic Director and Treasurer at St. Anthony's parish, and a member of the board of the North Akron Baseball Association. Ludle will start December 1, and his salary will be $106,454 per year, the same as the previous Deputy Director of Public Service. At 150 years old -- give or take a few years -- one of Akron's oldest residents is about to come down. A White Ash tree at the corner of West Exchange and Elmdale had served as a rallying cry for the neighborhood over a decade ago when safety concerns put it in jeopardy, but it was a tiny bug that ended up undoing the long history of the Akron landmark. The City says it'll start taking the tree down today after damage from the Emerald Ash borer proved too extensive to keep the massive tree up. It's just too much of a public safety hazard with limbs extending to the sidewalk but also well into the street. Detours will be posted through construction. (City of Akron) The large White Ash located on the southwest corner of Elmdale Avenue and West Exchange Street is scheduled to be removed on Thursday, November 12, 2015 for safety reasons. The tree has suffered significant damage created by the Emerald Ash Borer. In 2002, the tree was scheduled to be removed for the installation of a new curb ramp. The outcry from concerned residents resulted in the tree being saved, and alternative methods being used to construct the curb ramp. Since then, the City has performed annual inspections of the tree and remediated any hazards or defects as they appeared. The infestation began with the insect coming into Michigan in pallets from China. The Ohio Department of Agriculture reports that it was first detected in Ohio near Toledo in 2003, then moving into nearly all other parts of the state including our area. Because the Emerald Ash Borer is now established throughout most of the state there are no longer quarantine regulations in place within Ohio, although they still recommend caution when moving firewood. Ohio has a reported 3.8 billion ash trees. In 2012, the first signs of the Emerald Ash Borer were detected in the upper canopy of the Elmdale ash tree. Jon Malish, a Landscape Technician with the City, has watched the progression of this insect as it has spread throughout the City. "The borer is devastating our Ash trees. They tunnel galleries just under the bark and cut off the supply routes for water and nutrients to flow from the roots to the leaves. When this happens, the tree begins to die," Jon Malish said. This has happened to tens of thousands of White Ash trees in Ohio, including over 500 White Ash trees in Akron rights-of-way alone. Unfortunately, the White Ash on Elmdale has met the same fate. The City's Director of Public Service, John Moore, said "The safety of pedestrians, residents, and the traveling public are our primary concern. The tree could come down during a storm, during heavy wind, or under its own weight or the weight of snow. The tree has dead limbs as thick as 24 inches hanging over West Exchange. No one in Akron wants to see this beautiful old tree taken down, but as it stands today, the tree poses a serious risk to the public. We have no choice." But, while the tree may be ending its watch on the corner of Elmdale and West Exchange, it will live on through the collaboration between the City and local artists. When informed that the tree had to be removed, Mayor Fusco came up with the idea to use the City's Summer Arts Experience program to create a lasting tribute to the tree. "After the experts concluded that the tree had to come down, I decided we had to find a way to preserve and celebrate its history" said Mayor Jeff Fusco. "Through the Summer Arts Experience, a local artist, with the help of Akron youth, will create an historical timeline of Akron by using the growth rings from the cross sections of the tree trunk." Jon Malish estimates that the tree is 125-150 years old and an extraordinary 60+ inches in diameter at its base. "When you think about the historical events that occurred during the lifetime of this tree, it is truly remarkable. We need to celebrate and respect this natural historical wonder, as we safely remove it from the neighborhood." The City's hope is that these art installations will be displayed at various locations throughout the City. The City will also be preserving the stump for possible use as a "permanent chair" or bench for pedestrians. During removal, the tree will be cut into log-length sections and preserved and stored for future use in these types of projects. "I also invite and encourage any Akron citizens wanting to make creative use of this tree to submit proposals for other uses of the logs as carvings, benches, or other art." Mayor Fusco said. The City would be willing to collaborate with residents in seeking out funding sources for projects. The owners of the abutting property at 1492 W. Exchange recently submitted a proposal for funding to the Knight Arts Challenge for a potential project involving the tree and are awaiting a decision. "Regrettably, we are losing this beautiful tree which has watched over many generations of Akronites, but have been impressed with Mayor Fusco's ingenuity and cooperation to preserve its memory for our community," stated homeowner Megan Moreland. "My family and I look forward to playing a role in the development of the artwork that will tell the story of our dear ash and welcome our neighbors into the process so its passing will be given purpose." The City will close Elmdale Avenue from Malden Street to West Exchange Street. Detour signs will be posted. The detour route will be west on West Exchange, south on South Hawkins to Mull Circle. In a statement loaded with apologies to a city hall employee he's known for 14 years, his wife of 25 years Sandy, his cabinet members, the Moneypenny family and the citizens of Akron, Garry Moneypenny's political ambitions flamed out because of inappropriate touching of a female co-worker at City Hall who was congratulating him on his appointment as interim mayor during the transition following then-Mayor Don Plusquellic's resignation a month ago. "I take full responsibility for my actions," Moneypenny said, adding he would not run for Mayor but would serve the remainder of the term he assumed only five days ago. "I turned a good-bye hug into a too personal encounter...I clearly violated a professional and personal boundary." In the Q&A following the statement, Moneypenny noted no charges or complaints had been filed. "I regret violating the very same principles I've spent my entire career upholding," Moneypenny said, noting his career as a law enforcement officer included working with victim assistance programs. Reporters pressed Moneypenny about whether it's okay to remain in office if it's not okay to run for a full term. "I have been elected to this position by my peers on council and put into this position as our charter (provides)," said Moneypenny. I believe that I am still at this point the best to move forward with this city on an interim basis." If it's okay to remain in the position for six month, then why not run for a full term? "I've made a mistake here," said Moneypenny. "There are people who got out of this election race so I could run and this gives them plenty of time to go out and get their signatures at this point." (City of Akron) In my last week in office as president of city council, I behaved inappropriately with a city employee, who came to my office to wish me well on my transition to mayor. In the emotion of the moment, I turned a good-bye hug into a too-personal encounter. I have known this employee for over 14 years. We have always had a very professional relationship. And I clearly violated a professional and personal boundary. Words cannot describe the remorse I feel for my actions. I spent 37 years in law enforcement. I've spent years in service to Victim's Assistance. I regret violating the very same principles I've spent my career upholding. I offered my unconditional apology to this employee. I apologized to my wonderful wife of 25 years. I apologized to my cabinet members. And now, I offer my apology to the citizens of Akron who trust me to serve as mayor. I take full responsibility for my actions. I know this incident calls my character and my trustworthiness into question. For this reason, I have decided that I will not be a candidate for election to mayor and I will not appear on the ballot in September. I will do my best to serve as the city's interim mayor and will pledge my support to the new administration when the new mayor is elected.